For other uses, see Superstar (disambiguation). Superstar is someone who has great popular appeal and is widely known, prominent, or successful in some field. Celebrities referred to as "superstars" may include individuals who work as actors, musicians, athletes, and other media-based professions. 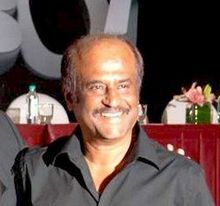 Rajinikanth, once the highest paid actor in India, is often referred to as "superstar". The earliest use of the term "superstar" has been credited to Frank Patrick in reference to the great hockey players on his Vancouver Millionaires teams of the 1910s-1920s, specifically Cyclone Taylor. . Bollywood actor Akshay kumar is listed one of biggest Superstar of Asia. "Super Star" is the name of a hugely successful rose which Harry Wheatcroft introduced and named in 1960, licensed from a German developer..
By 1909, the silent film companies began promoting "picture personalities" by releasing stories about these actors to fan magazines and newspapers, as part of a strategy to build "brand loyalty" for their company's actors and films. By the 1920s, Hollywood film company promoters had developed a "massive industrial enterprise" that "... peddled a new intangible—fame." Hollywood "image makers" and promotional agents planted rumours, selectively released real or fictitious biographical information to the press, and used other "gimmicks" to create personas for actors. Then they "...worked [to] reinforce that persona [and] manage the publicity." Publicists thus "created" the "enduring images" and public perceptions of screen legends such as Rock Hudson, Marilyn Monroe and Grace Kelly. The development of this "star system" made "fame... something that could be fabricated purposely, by the masters of the new 'machinery of glory.'" 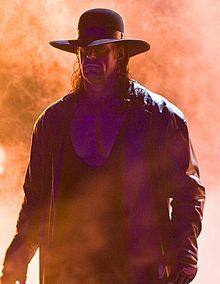 The Undertaker, the longest tenured and one of the most famous WWE Superstars. According to Sofia Johansson the "canonical texts on stardom" include articles by Boorstin (1971), Alberoni (1972) and Dyer (1979) that examined the "representations of stars and on aspects of the Hollywood star system." Johansson notes that "more recent analyses within media and cultural studies (e.g. Gamson 1994; Marshall 1997; Giles 2000; Turner, Marshall and Bonner 2000; Rojek 2001; Turner 2004) have instead dealt with the idea of a pervasive, contemporary, 'celebrity culture'." In the analysis of the 'celebrity culture,' "fame and its constituencies are conceived of as a broader social process, connected to widespread economic, political, technological and cultural developments." In 1976 Mattel, Inc. produced a Superstar concept of its Barbie™ Doll. In the 1980s and 1990s, entertainment publicity tactics have become "more subtle and sophisticated", such as using press releases, movie "junkets, and community activities. These promotional efforts are targeted and designed using market research, "to increase the predictability of success of their media ventures." In some cases, publicity agents may create "provocative advertisements" or make an outrageous public statement to "trigger public controversy and thereby generate "free" news coverage." Katy Perry Part Of Me movie premiere in Sydney, Australia. She is an American singer and the latest superstar. Some of her music videos have been viewed over a billion times on Youtube. According to Roger Caillois, superstars are created by the interplay between "mass media, free enterprise, and competition." Superstars are produced by a mixture of effort by the actors or athletes and chance (the luck of winning, due to the many arbitrary factors influencing sports, film releases, etc.). The "superstar has extraordinary natural talent augmented by an even more extraordinary perseverance and drive." Musician Park Jae-sang (stage name PSY) of South Korea was referred to as "globalstar". One of his videos was viewed over 2.2 billion times on YouTube, the highest views recorded in YouTube's history. However, "small and relative differences are of decisive importance for winning or losing by a hair's breadth." It is here that chance plays a role; a sudden gust of wind at the end of a yachting race can mean the difference between stardom and defeat. Caillois notes that the role of chance in superstardom is paradoxical, given that the west is such a "predominantly meritocratic society," which valorizes the role of work, competition, activity, and determination. "[Since] only one may be first. [a person may] choose to win indirectly, through identification with someone else"- the superstar, whose triumph as the most popular actor or hit recording artist is in part due to the actions of "... those who worship the hero". The public believes that "the manicurist elected Beauty Queen, by the sales girl entrusted with the heroine's role in a super production, by the shopkeeper's daughter winning the Tour de France, [and] by the gas station attendant who basks in the limelight as a champion toreador" represents the chance or possibility, from the public's perspective, that they may become wealthy and successful. For example, Levine points out that "Lars Ulrich, the drummer for Metallica, was a service station attendant before becoming a rich rock star; Harrison Ford was a cabinet maker" before becoming a wealthy film star. Caillois calls superstars' huge incomes and rewards "disguised lotteries", a "special kind of game of chance." For example, the grand prizes for literary competitions "bring fortune and glory to a writer, for several years." Caillois notes that a "superstar" cannot merely be successful at some activity; they must also be richly rewarded. He says that the "material reward of the superstar is a necessary ingredient (for the glory of the star) for the identification of the public with the star, or whether it is the excellence or the private life of the star which is of more importance." He states that superstars' extravagant incomes play an important psychological "compensating mechanism" role for the public. According to Madow, "fame is a "relational" phenomenon, something that is conferred by others. A person can, within the limits of his natural talents, make himself strong or swift or learned. But he cannot, in this same sense, make himself famous, any more than he can make himself loved." Madow goes on to point out that "fame is often conferred or withheld, just as love is, for reasons and on grounds other than "merit." This means that regardless of how "... strenuously the star may ... try to "monitor" and "shape" it, the media and the public always play a substantial part in the image-making process." Jackie Chan at the 2008 Cannes Film Festival. He is one of the most well known Chinese people in the world. Sherwin Rosen (1981) examined the economics of superstars to determine why "relatively small numbers of people earn enormous amounts of money and seem to dominate the fields in which they engage." Rosen argues that in superstar markets, "small differences in talent at the top of the distribution will translate into large differences in revenue." Rosen points out that "...sellers of higher talent charge only slightly higher prices than those of lower talent, but sell much larger quantities; their greater earnings come overwhelmingly from selling larger quantities than from charging higher prices"
Modern microconomist Alfred Marshall explains that technology has greatly extended the power and reach of the planet's most gifted performers. He referenced a classical of the British opera singer Elizabeth Billington. She was a well-acclaimed soprano with a strong voice, that, naturally did not have access to a microphone or amplifier in 1798, let alone to MTV, CDs, iTunes, and Pandora. She could only reach a small audience. This limited her ability to dominate the market in the way that artists to do today. Marshall wrote, “so long as the number of persons who can be reached by a human voice is strictly limited, it is not very likely that any singer will make an advance on the £10,000 said to have been earned in a season by Mrs. Billington at the beginning of the last century, nearly as great [an increase] as that which the business leaders of the present generation have made on those of the last.” Furthermore, the trends in popular music indicate that "the price of the average concert ticket increased by nearly 400% from 1981 to 2012, much faster than the 150% rise in overall consumer price inflation. Some scholars argue that superstardom has a useful role in society. Caillois cites Rawls, who states that the "premiums earned by scarce natural talents . . . [serve] to cover the costs of training and to encourage the efforts of learning, as well as to direct ability to where it best furthers the common interest." Cowen (2000) cites Rosen (1981) to argue that "the superstars effect is welfare-improving (consumers get better performances) even if it leads to raising income inequality," and adds that the "superstar phenomenon should not be overstressed. Indeed, fame is a positive-sum game, not a negative nor a zero-sum one." Cowen states that "countervailing forces operate, such as a convergence of quality that limits the ability of the very best stars to dominate the market for long, or more radically the elastic supply of fame." This means that "when demand for fame increases, the numbers of prizes, rewards and whatever fame generating distinctions is rising too." On the other hand, it has been argued "compensation systems that resemble prizes [lotteries] can also create perverse incentives by discouraging cooperative behaviour and may encourage some contestants to disrupt the performance of competitors". As well, Frank and Cook (1995) have called "into question the way the winner-take-all markets operate, with their damaging features." They argue that the "winner-take-all payoff structure [of competition for superstardom] generates a spiral of individual and social occupational waste, since it leads both to increasing (monetary and non-monetary) reward inequalities and to overcrowdings in the markets and occupations prone to an overestimation of one's chance to succeed." Thus as a result, they argue that "when excess numbers of contestants are induced to invest in performance enhancement in order to raise their individual odds of winning, these investments will be mutually offsetting and socially inefficient; end consumers may get more valuable products but the social costs are excessive." A small number of major art museums, including Frank Lloyd Wright's Guggenheim Museum in New York, the Centre Pompidou in Paris, Frank Gehry's Guggenheim Museum in Bilbao, among others, have become household names and major tourist destinations. Art museums such as these, with their striking, architecturally designed buildings and very well known masterpieces can be termed "superstar" art museums. With their huge visitor traffic, superstar museums are often able to derive a significant income from museum bookshops and restaurants and have a "major impact on the local economy". Superstar museums are able to use the popular appeal of their location and art holdings to produce their own books, videos, and television specials, which adds an additional revenue stream and further reinforces the public's awareness of the museum. Some superstar museums have also begun establishing museum networks. For example, London's Tate Gallery has launched satellite art museums at Liverpool and St. Ives. Cultural institutions such as art museums play a "gatekeeping role" for consumers, helping to screen and grade the cultural artifacts and artworks, thus "reduc[ing] information and search costs" for consumers. Moreover, "by channelling resources to a limited group of visual artists, cultural institutions also enhance superstar phenomena within the visual arts." McGraw-Hill's economic website argues that the multimillion-dollar salaries of superstar Chief Executive Officers (CEOs) in the corporate world can be viewed as a type of tournament prize. The huge salaries of superstar executives "often seem to resemble prizes for the winners of contests rather than compensation in return for the value of the marginal product of labour." As an example, "a company may have many vice-presidents of roughly comparable ability and the v-p (who may only be slightly more talented than the others) that is promoted to president receives a huge salary increase, which resembles a prize for winning the contest as best v-p."
The article goes on to argue that "...such a compensation system may be efficient if the organization is only able to rank its executives according to the relative value of their contribution to the organization (the organization cannot measure the productivity of each executive, only the productivity of the group of executives)." Moreover, "even if executives are paid a wage equal to the average productivity of the group, there will still be an incentive to perform in order be promoted and win the prize." However, "compensation systems that resemble prizes can also create perverse incentives by discouraging cooperative behaviour and may encourage some contestants to disrupt the performance of competitors"
^ Sharma, Neha (29 September 2010). "Rapchik Rajinikanth, mind it!". The Hindustan Times. Archived from the original on 24 December 2014. Retrieved 23 June 2014. ^ John Nyren, The Cricketers of my Time, Robson, 1998, p.57. ^ Press, The Canadian. "Vancouver brothers sculpted game of hockey 100 years before Canucks vied for cup - The Hockey News". thehockeynews.com. Retrieved 2 April 2018. ^ O’Brien, Glenn (June 1977). "Andy Warhol". Interview Magazine. ^ "Super Star (Hybrid Tea Rose)". www.countrygardenroses.co.uk. Retrieved 2 April 2018. ^ a b c d "?". Archived from the original on March 23, 2002. ^ Johansson, Sofia. "Editorial" (PDF). Communication and Media Research Institute of the University of Westminster. ^ BarbieCollectors (22 December 2008). "1976 Superstar Barbie Doll Commercial Full Length High Quality". Retrieved 2 April 2018 – via YouTube. ^ a b c d Loek Groot (2000). "Roger Caillois, Games of Chance and the Superstar" (PDF). Diogenes. ICPHS /Blackwell Publishers. 48/2 (190): 33. Archived from the original (PDF) on 5 October 2011. Retrieved 7 December 2010. ^ "Sivaji: The Boss set to release on Friday - Businessofcinema.com". businessofcinema.com. 14 June 2007. Retrieved 2 April 2018. ^ Alan Krueger (2013). "Land of Hope and Dreams: Rock and Roll, Economics, and Rebuilding the Middle Class". ^ Pierre-Michel Menger. ""Statistics in the Wake of Challenges Posed by Cultural Diversity in a Globalization Context"" (PDF). Centre de Sociologie du Travail et des Arts Paris, France. gouv.qc.ca. Retrieved 7 December 2010. ^ a b c "?". Archived from the original on 2004-08-16. ^ a b c "?" (PDF). Archived from the original (PDF) on 2006-05-19. ^ "?". Archived from the original Check |url= value (help) on 2013-08-19. Hamlen, William A. "Superstardom in Popular Music: Empirical Evidence." Review of Economics and Statistics 73 (1991): 729–33. Koutsobinas, Theodore. The Political Economy of Status: Superstars, Markets, and Culture Change (Edward Elgar Publishing; 2015) 264 pages; on the societal impact of luxury consumption and status markets, and the media's fascination with superstars. MacDonald, Glenn M. "The Economics of Rising Stars." American Economic Review 78 (1988): 155–67. Rosen, Sherwin. The superstar effect – "The Economics of Superstars", American Economic Review, 71 (1981). Salganik, Matthew J., Peter Sheridan Dodds, and Duncan J. Watts. "Experimental Study of Inequality and Unpredictability in an Artificial Cultural Market." Science 311 (2006): 854-56. Pattni, Anandi. 'Superstars: People who are good to me' Vanity Fair 157 (2007): 185–89. Grinin L., "People of Celebrity" as a New Social Stratum and Elite. In Hierarchy and Power in the History of Civilizations: Cultural Dimensions (pp. 183–206). / Ed. by Leonid E. Grinin and Andrey V. Korotayev. Moscow: KRASAND, 2009 Работы на иностранных языках 2009г (in Russian). Retrieved 7 December 2010.